Choosing to forego revenge, and looking to the future instead. An interview with Rigoberto Urán. When Rigoberto Urán was only 14 years old, his father was gunned down near Urrao, Colombia. Most said he died at the hands of paramilitary forces, but considering the mood in Colombia at the time, it could have been any number of groups, for any number of reasons. As Urán himself has said in the past, "...it was how things were back then. Many innocent people died." Encouraged by his father, Rigoberto had competed in his first bike race just three months earlier. They had trained together during those three months, wearing regular street clothes, since proper cycling attire was simply beyond what the family could afford. The violence that defined Urrao continued into 2001 (although for different reasons), when 14-year-old Rigoberto Urán became the head of his household. Due to his father's violent death, Rigoberto suddenly had his mother Aracelly and sister Marta Lucia to to take care of. He took over his father's job, selling lottery tickets in order to provide for his family. He would leave the house at 7am, only to return close to midnight. He continued attending school, training, and racing, while trying to lift his family out of the poverty in which they lived. Unlike many in Colombia, who might seek revenge for their father's death in one way or another, Urán chose to move forward. Although his father's passing clearly affected him, his drive to succeed was also sizable. This was significant on a personal level, but also exemplary of Colombia's changing mood at that time. By then, Colombians had grown exhausted of the violence, the countless deaths, and they slowly became aware of how seeking retribution had exacerbated matters for decades. Like Uran, Colombia as a whole wanted to move forward, and wanted to succeed. But that had not been the case in years prior. The country had often reveled in its own horrible state. As such, the need to seek retribution took hold over the years all over Colombia. In Antioquia, the Colombian department where Urrao is located, there is even an expression for one's need to seek revenge, and for that revenge itself: culebra. The term speaks of an outstanding debt, but not a monetary one. It's sworn revenge of the physical kind. Perhaps most telling about this term, however, is the fact that "culebra" literally means "snake". This is because revenge in violent times is often complicated and lengthy, with one "culebra" easily being intertwined with another, to the point that no one remembers how the killings began, and no one can tell them apart. One assassination is revenge for another, which itself was revenge for a random killing. It goes on and on. It was this mentality that shaped the Colombian narrative for much of the last century, and certainly shaped the lives of those of us who grew up there in one way or another. It was a pervasive and ongoing thread in the state of the country. But Urán, like others in his generation, chose to break the cycle of violence. He had other goals in mind. At sixteen, Urán told his team director in the Orgullo Paisa team that due to time constraints, he'd be unable to keep training. He had to turn professional now or simply sell lottery tickets full-time, never to race again. Since the age required to turn professional was 18, Rigobrto's request was a difficult one for the team take. In the end, it was Rigoberto's mother who signed and was technically awarded the contract and license, allowing him to become a professional at 16 years old. Three years later, Urán went to Italy and began racing for Tenax. He's raced for European teams ever since. As Rigoberto's career in the sport developed, and his results improved, so too did conditions in Colombia. The violence that terrorized the country's citizens began to subside, and eventually a drastic change was palpable. The government and the army slowly started to turn the tide in the ongoing war against guerrillas, paramilitaries, drug lords and low-level thugs. More importantly, however, Colombian citizens started to take back their country. As a result, Colombia today is vastly different from what it was even as recently as 2001, when Rigoberto's father was killed. It's also very different from what it was back in 1987, when Colombia's Lucho Herrera won the Vuelta A España, making him a national hero of the grandest proportions. It was in 1987, incidentally, that Rigoerto Urán was born. Just as one chapter in Colombian cycling was reaching its peak, another one was just starting out. It's perhaps with this widespread positive change in mind that Rigoberto gives support to the cycling club in Urrao today. The club that helped him overcome hardship as a young man. He has helped fund the club, and rides with them when he's back in Urrao. He relays the vast amount of knowledge he has gathered over the years to a young crop of riders. A significant amount of work remains to be done with the cycling club in Urrao, and Rigoberto knows that. But he also knows there is another generation of kids who, like him, can overcome adversity if given a chance. He sees cycling as the perfect tool to make that happen. Thanks to Rigoberto for his time, and to the ever-gracious Matt Rendell for his assistance in helping me contact Rigoberto. What was your life like as a kid in Urrao? As I saw it, it was a rather common life, like that of any adolescent. I went to school, and always played sports, but never took kup cycling as a young kid. My mom was a homemaker, while my dad sold lottery tickets. Why did you first become interested in cycling? It was because I would go on rides with my dad. Every Sunday, we would go on these really long rides, simply for fun. That's how I became interested in the sport. What about your first race? Well, one day my dad said I should sign up for the local cycling club in Urrao. I said I would, and I signed up just eight days before there was going to be a time trial in Urrao. I had no idea how races worked, so my coach actually had to tell me before it started to "get to the finish line as quickly as possible." I did, and I won that day. Forgive me for asking a question about a very delicate topic, but how did the death of your father influence your cycling career? In Colombia, we lived through a war in those years. My father was a victim of that war. When he died, I was already in the cycling club/academy, so I continued riding. I took on my dad's job when he died. I kept going to school, and it was very hard at first. But I became accustomed to it, and time passed. I've been very lucky, and I think my arduous dedication to the bike took me to Europe faster than I ever imagined. How did the death of your father Rigoberto come about? Urrao was a town that was really hit very hard by violent armed groups. Paramilitaries, guerrillas...the works. We lived through a war in which many innocent people were killed, hard working people. One of those individuals was my dad, who died in August of 2001. One morning he went out to train on his bike, and they had set up an illegal road block. That's where he was taken, and he was later assassinated. We've been told that he was one of three people that were killed. These paramilitaries took three people from the traffic stop on the road, and forced them to help steal some livestock from a large farm, and afterward, they were killed. And that's the conclusion, based on what you know of the events? Yes, because my father didn't have any problems with anyone in Urrao. He was a kind person that everyone knew. He owed nothing to no one, he just worked. So that's the information we got from the people in that area. And that's how you became the head of the household, the father figure of your family? Yes, and it was very hard because I was so attached and devoted to my father. I kept working, doing his job, which was selling lottery tickets on the street. I did that because it was effective work, and I did that until 2002. You signed your first professional contract at 16, when you normally have to be 18 to turn pro. How did that come about? In Colombia, I raced for the Orgullo Paisa team. With them, I had many victories, as I did with the national team on both road and the track. Through those victories, the chance to race in Europe for Tenax came up. I didn't think about it twice, and went. That started the path that I'm currently on. How do you think that cycling changed your life, and how do you think it could change the lives of young people in Colombia? Did you see cycling as a way of escaping the tough realities of Colombia at the time? No, I never saw it as a way of escaping. It did change my life however, since I had series of obligations in my life as a kid. I also had to learn how to take care of myself, and taking good care of everything around me, since the life of an athlete is not at all like the life of a common person. How did your relationship with the cycling club in Urrao begin, and what would you like its future to be? That club is where my roots are. I had their support when I needed it most, so I see me helping them as a way of giving back to young kids who need that help. I think sports, cycling in particular, is a good way to help these kids who come from such meager backgrounds. I see how motivated they are, and how strong their drive to improve and perhaps become a professional can be. How does the club operate? The club is set up as a place where the kids can learn to race, but it's also a place where they can grow as people. It's also important that they keep up with their studies, since they wont be taken to any races if their grades drop below a certain level. The club has around fifty kids, but we have no real help getting them things like bikes or proper clothing. Luckily, we have people who are willing to work on this, and we are working slowly making things happen. Do you foresee a time when people in wealthy nations (like the United States) can perhaps donate to the club, in order to help? Yes, of course. That's the idea. I want to let people know about the club, in order to show them how amazing these kids are, and how strong their dreams to succeed are. They come from very needy families, and even though many may not reach the professional ranks, I think their youth will be affected positively, and it will be great that they spent this time in their life doing something positive. These kids come from places where they actively need positive things in their lives. Colombia is a very different place from Europe in many ways. I've heard several stories from Colombian professionals regarding the culture shock they underwent upon reaching Europe, and the cultural isolation they felt a a result. That isolation, as I see it, is much stronger that what an American would feel, particularly because of the type of rural towns that most Colombian cyclists come from. How did you adapt to racing in Europe when you moved there at such a young age? It was very different, absolutely. But when you grew up as I did, and you want something badly enough, you can achieve it. I mean, yes, at first it was very, very hard. It hit me like a ton of bricks. Things were very different. I felt so incredibly isolated in Europe, I was so far from my family and friends. It was difficult, and I can see why some simply can't make their way through that isolation.
. What's it like living there during the season? Does Soler leave dirty dishes in the sink, or does Ardila leave his bike in the middle of the living room after training? We live together, yes. But you know, we are almost never in the house at the same time, so things like that aren't an issue. Ardila has a similar racing calendar as mine, but we see each other very little in Spain. This is mostly because I tend to spend most of my time between races in Colombia training, as opposed to training in Europe. I just prefer training in Colombia. Dennis Menchov also lives in Pamplona, which probably accounts for his flawless Spanish. Do you train with him, or see other riders in Pamplona socially when you are there? I do. Pamplona is one of the cities with the most professional cyclists that I know of. We have fourteen living there now. We are a tight-knit group, training together, and sometimes going out for dinner. I've always been interested in how superstitious many cyclists are. Additionally, I'm aware of how insanely superstitious we Colombians are in general. So a Colombian professional has to be, I imagine, insanely superstitious. Is that the case for you? No, not at all. Nothing like that. I have no real superstitions or rituals, although you do have to have good luck in cycling in order not to have crashes. It's a sport filled with sacrifice and potential pain, that's for sure. There's no way around that. In the 1980s, Colombian cyclists who raced in Europe famously ate bocadillo and drank aguapanela during races. 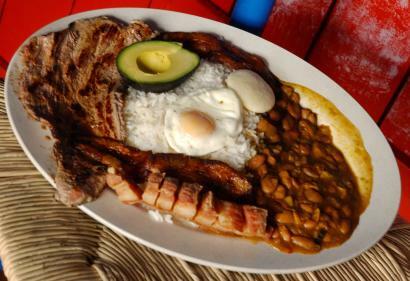 Similarly, Colombian legend Ramon Hoyos once said to me that the ideal meal for a cyclist is a huge bandeja paisa. Clearly, our understanding of nutrition has changed over the years... for the best. But is there still room forbocadillo, aguapanela or a bandeja paisafrom time to time? Of course there's room! But most of those things are for the off-season. I also see their importance because they are our customs as Colombians, and most importantly, those things taste really, really good! How different are Caisse d'Epargne and Sky as teams? They are both great teams, no doubt about that. But here, at Sky, we work very differently. Objectives are very well planned out, and the mentality towards racing is completely different. Are you learning English now that you're on a British team? I study a good bit, but learning is slow. I work at it with the team. You were fifth at Liege-Bastogne-Liege, a great result, and easily the best result by a Colombian at that race. Would you like to focus more on the Ardennes classics in the future? I like those races, but it's also very important to ride well in three-week races. That's a focus for me. Thankfully, things have changed in Colombia from the time when Lucho Herrera and Oliverio Rincon were kidnapped, or when Victor Hugo Peña was robbed at home only a few days before the Tour. Do you take certain precautions when training in Colombia now? Yes, I do. I always train with others. You obviously prefer training in Colombia over Europe. Why? Where I train in Colombia, it's 77 degrees [25 Celcius] year round. I'm at 7,500 feet [2,300 meters] and the riding is great. The roads are fantastic, so it's a great place to train, and to get ready for the season. At the start of this season, you trained with Italian Mateo Carrara (Vacanosoleil) in Colombia. What did he think of training in Colombia, since so few Europeans train there? He really liked it, and actually came back again before the Giro to prepare. We do have other professionals training here, although it's a bit far for most of the guys who live in Europe. For those interested in training or riding in Colombia, what would you recommend as an ideal location to ride in? To me, the very best place to ride and train is to the west of Medellin. It's the best area in the country, and in all of South America actually. The roads are great, you have two airports with connecting flights that can get you anywhere, great hotels, and the people are extremely welcoming and kind. In the 80s, and early 90s, people like Fabio Parra, Oliverio Rincon and Luis Herrera always spoke about feeling like they represented Colombia to the world. This is perhaps due to the negative image that Colombia has always had, and is thus different from how other cyclists view the relationship they have with their country of origin. Is this something you think about? Yes. To me, it's clear that I race for a British team, but I'm also a representative of Colombia. I'm a representative at all times, not just when I put on the national jersey to represent Colombia formally. If you could change the way people around the world view Colombia, what would you like them to know about the country? They seem to know a lot, or think they do. They think that we live like savages here, that it's not a civilized place. But if they come to visit, they'll be impressed by how things actually are, how things function, by the beauty and by our people. I have friends from Italy who are like parents to me. They came to visit on two different occasions, and the first time they were absolutely frightened to even be here, but they left with a completely different opinion, and now love it here. It changes everyone's mind once they come. If we speak again a year from now, what do you hope we'll be talking about regarding the current season? From a sporting perspective, that I did an excellent Tour de France. That aside, I hope we get more support for the club, and for the kids of Urrao. This interview was first published here last summer, shortly before the Tour de France. It was subsequently published in Road Magazine. You can learn more about the cycling club that Rigoberto supports here. You can follow Rigoberto on Twitter here. Lastly, if you want to learn about the first gold medalist in road cycling (in the 1948 London Olympics), read this interview with Matt Rendell, who wrote Jose Beyaert's biography. Beyaert's life was an amazing one. From boxer to gymnist, to cyclist, to gun runner and (more than likely) hired assassin, the French cyclist lived most of his live in Colombia, a country he loved very, very deeply.